Accenture Digital Agriculture Service and Connected Crop Solution help the agriculture ecosystem fulfill its potential. Digital technologies and analytics are transforming agriculture, making a farm’s field operations more insight driven and efficient. Digital-based farm services are helping to improve financial performance and boost yield. But less than 20 percent of acreage today is managed using digital agriculture technologies (e.g., variable-rate spraying) due to the high cost of gathering precise field data. To help farmers increase productivity and profitability, Accenture has combined digital technologies such as the Internet of Things with its big data analytics, visualization capabilities, and industry knowledge to create the Accenture Precision Agriculture Service and the Accenture Connected Crop Solution. Learn more about these two innovative Digital Agriculture solutions below. By generating detailed insights into operations and the environment, it assists farmers in making data-based operational decisions to optimize yield and boost revenue while minimizing expenses, the chances of crop failure, and environmental impact. Depending on the crop, the Digital Agriculture Service can help increase overall profitability by $55 to $110 per acre. The Digital Agriculture Service can be used in a wide variety of ways to address inefficiency in farming operations across crop types. For example, the Digital Agriculture Service can help a farmer decide when to harvest. The service could send an alert that a particular plot might be ready for harvest earlier than expected. The farmer can quickly see how each scenario would affect the crop’s profitability. This is one example of how farmers can use the Digital Agriculture Service to increase their operating margin by boosting revenue, increase operational efficiency, and reduce the cost of goods sold. follow traditional farming practices because they lack access to the latest information, including a scientific understanding of pest lifecycles and the latest micro-fertilizers. In contrast, Agro-input companies have the products to help farmers gain maximum yields through that latest fertilizer technology, seeds, and pesticides. The field-agent represents the key link between company and farmer, yet these workers lack the agricultural knowledge, technology, and processes to recommend the right products to farmers. So when farmers see little or no benefit to the relationship, the result is a lack of loyalty toward the agent, resulting in job frustration and attrition. Current ecosystem challenges keep smallholder farmers, field agents and agro-input companies from achieving their full potential in the agriculture industry. 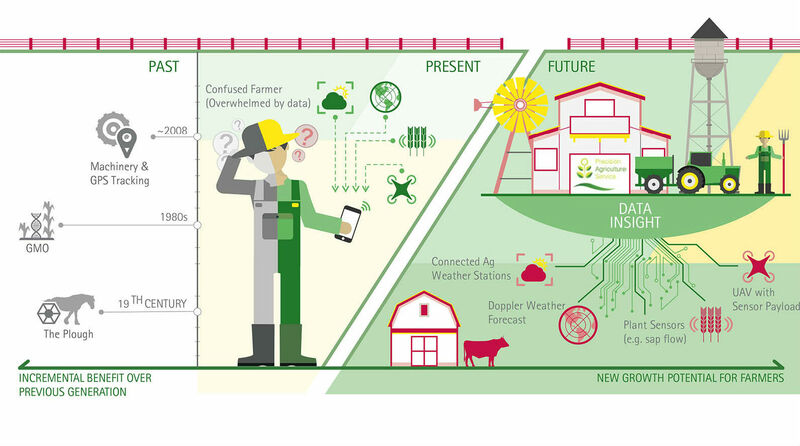 The Accenture Connected Crop Solution connects the three stakeholders—field agent, agro-input company, and farmer—in order to improve agent productivity, product sales, and farmer crop yield. And end-to-end farm management solution, the Accenture Connected Crop Solution integrates and processes data from multiple sources into a single hub via a handheld/smartphone application. Through a cloud-based analytics engine, the field agent can provide recommendations for each farmer on regular nutrition management for crops, timing and quantity of fertilizer application, irrigation needs, and seed quality, as well as actions needed to address specific crop issues. A mobile application on the field agent’s hand-held device is the hub for connecting the farmer to the agro-input company with a steady stream of information and advice for improving crop yield throughout a season. Improving yield is an age-old challenge for farms and always will be. The Accenture Digital Agriculture Service and the Accenture Connected Crop Solution can help large and small farms alike harness digital technologies to improve processes, boost their yield, and increase profitability, helping to meet the growing global food demand and lowering the overall environmental impact of farming.